Bu çalışmanın amacı, fen bilimleri öğretmenleri için Aktif Öğrenmeye Yönelik Eğilim ölçeğini geliştirmektir. Araştırmada genel tarama modeli kullanılmıştır ve çalışmaya 120 fen bilimleri öğretmeni katılmıştır. Aktif öğrenmeye yönelik eğilim ölçeğinin faktör yapısını belirleyebilmek için hem açımlayıcı faktör analizi hem de doğrulayıcı faktör analizi teknikleri kullanılmıştır. Açımlayıcı faktör analizi sonucunda, ölçeğin tek faktörden ve 23 maddeden oluştuğu, doğrulayıcı faktör analizi sonucunda ise ölçeğin yeterli uyum indekslerine sahip olduğu belirlenmiştir. Ayrıca ölçeğin Cronbach alpha katsayısının .95 olduğu ve varyansın %69.43’ünü açıkladığı sonucuna ulaşılmıştır. The purpose of this study was to develop Active Learning Tendency scale for science teachers. General survey model was used and 120 science teachers took part in the study. Both exploratory and confirmatory factor analysis techniques were used to determine the factor structure of scale. As a result of the exploratory factor analysis, it was found out that the scale consisted of a single factor and 23 items, and as a result of the confirmatory factor analysis, it was found out that the scale had satisfactory fit indexes. In addition, the results showed that the Cronbach Alpha coefficient of the scale was .95 and the variance explained 69.43%. Active learning tendency, science teachers, science course. 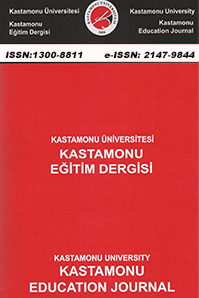 Akbulut, G. (2004). Coğrafya ve aktif öğretim yöntemleri. Erzincan Eğitim Fakültesi Dergisi, 6(1), 65-77. Bandiera, M., ve Bruno, C. (2006). Active/cooperative learning in schools. Journal of Biological Education, 40, 130-134. Broad, M., Matthews, M., ve Mcdonald, A. (2004). Accounting education through an online-supported virtual learning environment. Active Learning in Higher Education, 5(2), 135-151. Borg, W. R., ve Gall, M. D. (1989). Educational research: An introduction (5. Baskı). New York, NY: Longman. Buchberger, F. (2001). Active learning in powerful learning environments. Büyüköztürk, Ş. (2002). Faktör analizi: Temel kavramlar ve ölçek geliştirmede kullanımı. Kuram ve Uygulamada Eğitim Yönetimi Dergisi, 32, 470-483. Cherney, I.D. ( 2008) The effects of active learning on students’ memories for course content. Active Learning in Higher Education, 9, 152-171. Cook, E. D., ve Hazelwood, A. C. (2002). An active learning strategy for the classroom- “Who wants to win … same mini chips ahoy?. Journal of Accounting Education, 20, 297-306. Çelik, S., ve Bayrakçeken, S. (2012). The influence of an activity-based explicit approach on the Turkish prospective science teachers’ conceptions of the nature of science. Australian Journal of Teacher Education, 37(4), 75-95. Çelik, H. E., ve Yılmaz, V. (2013). Yapısal eşitlik modellemesi temel kavramlar-uygulamalar- programlama. Ankara: Anı Yayıncılık. Çokluk, Ö., Şekercioğlu, G., ve Büyüköztürk, Ş. (2010), Sosyal bilimler için çok değişkenli istatistik. Ankara: Pegem Akademi. Ercan, İ., ve Kan, İ. (2004). Ölçeklerde güvenirlik ve geçerlik. Uludağ Üniversitesi Tıp Fakültesi Dergisi, 30 (3), 211-216. Field, A. (2000). Discovering statics using SPSS for windows. London: Sage Publication. Fletcher, G. J., Simpson, J. A., ve Thomas, G. (2000). The measurement of perceived relationship quality components: A confirmatory factor analytic approach. Personality and Social Psychology Bulletin, 26, 340-354. Gedeon, R. (1997). Enhancing a large lecture with active learning. Research Strategies, 15(4), 331-309. Griffiths, Y., ve Ursik, K. (2004). Using active learning to shift the habits of learning in health care Education. The Internet Journal of Allied Health Sciences and Practice, 2(2), 1-5. Hsu, A., & Malkin, F. (2011). Shifting the focus from teaching to learning: Rethinking the role of the teacher educator. Journal of Contemporary Issues In Education Research, 4(12), 43-50. Joseph, K. E., ve Dai, C. (2009). Human resource management: A central business concern. International Journal of Busines and Management, 4(11), 130-136. Jungst, S., Licklider, L. L., & Wiersema, J. (2003). Providing support for faculty who wish to shift to a learning-centered paradigm in their higher education classrooms. The Journal of Scholarship of Teaching and Learning, 3 (3), 69-81. Kalaycı, Ş. (Edt.) (2010). SPSS uygulamalı çok değişkenli istatistik teknikleri (5. Baskı). Ankara: Asil Yayın Dağıtım. Kalem, S., & Fer, S. (2003). The effects of active learning model on the learning, teaching and communication process of students. Educational Sciences: Theory & Practice, 3(2), 433-461. Kelloway, E. K. (1998). Using LISREL for structural equation modeling: A researcher’s guide.Thousand Oaks, CA: Sage. Keyser, M. W. (2000). Active learning and cooperative learning: understanding the difference and using both styles effectively. Research Strategies, 17, 35-44. Lammers, W. J., & Murphy, J. J. (2002). A profile of teaching techniques used in the university classroom: A descriptive profile of a US public university. Active Learning in Higher Education, 3(1), 54-67. Lubbers, C., & Gorcyca, D. (1996). Using active learning in public relations instruction: Demographic predictions of faculty use. Annual Convention of the Association for Education in Journalism and Mass Communication, Anaheim, California. Mabrouk, P. A. (2005). Addressing faculty objections to the implementation of active learning strategies in the analytical chemistry course. Abcs Of Teaching Analytical Science, 383, 365–367. Mattson, K. (2005). Why “active learning” can be perilous to the profession. Academe, 91(1), 23-26. MEB (Milli Eğitim Bakanlığı) (2006). İlköğretim Fen ve Teknoloji dersi (6, 7 ve 8. sınıflar) öğretim programı. Ankara: Millî Eğitim Bakanlığı Talim ve Terbiye Kurulu Başkanlığı, 4 Mayıs 2007 Tarihinde meb.gov.tr adresinden temin edilmiştir. Meier, S. (2008). Measuring change in counseling and psychotherapy. New York: The Guilford Press. Miles, M. B. ve Huberman, A. M. (1994). Qualitative data analysis: An expanded sourcebook (2. Baskı). California: SAGE Publications. Modell, H. I. (1996). Preparing students to participate in an active learning environment. The American Physiological Society, 15(1), 69-77. Özdamar, K. (2004). Paket programlar ile istatistiksel veri analizi (5. Baskı). Eskişehir: Kaan Kitapevi. Pepper, K., Blackwell, S., Monroe, A., ve coskey, s. (2012). Transfer of active learning strategies from the teacher education classroom to prek-12th grade classrooms. Current Issues in Education, 15(3), 1-23. Pundak, D., Herscovitz, O., ve Shacham, M. (2010). Attitudes of face-to-face and e-learning ınstructors toward “active learning”. European Journal of Open, Distance and E-Learning. Qualters, D. M. ( 2001). Do students want to be active? Journal of Scholarship of Teaching and Learning, 2, 51-60. Schneider, R. M., Krajcik, J., Marx, R. W., ve Soloway, E. (2001). Performance of students in project-based science classrooms on a national measure of science achivement. Journal of Research Teaching In Science Teaching, 39(5), 410-412. Schunk, D. H. (2007). Öğrenme teorileri: Eğitimsel bir bakışla. (Cev. Muzaffer Şahin. Ed.). Ankara: Nobel Yayınları. Seçer, İ. (2013). SPSS ve LISREL ile pratik veri analizi. Ankara: Anı Yayıncılık. Shrock, S., & Coscarelli, W. (2007). Criterion-referenced test development -Technical and legal guidelines for corporate training. San Francisco: John Wiley & Sons, Inc.
Simons, P. R. J. (1997). Definitions and Theories of active learning. Stern, D. & Huber, G.L. (Eds. ), Active Learning for Students and Teachers: Reports from Eight Countries. Frankfurt & New York: Peter Lang. Stern, D. ve Huber, G. L. (1997). Active learning for students and teachers: reports from eight countries. OECD. Frankfurt and New York: Peter Lang. Sturgis, P. (1995). Surveys and sampling. G.M. Breakwell, Hammond, S. & Fife-Schaw, C. (Edt. ), Research Methods in Psychology. London: Sage. Winter, D., Lemons, P., Bookman, J., ve Hoese, W. (2001). Novice instructors and student-centered instruction: identifying and addressing obstacles to learning in the college science laboratory. The Journal of Scholarship of Teaching and Learning, 2(1), 14-42.
van Peer, W., Hakemulder, F., ve Zyngier, S. (2012), Scientiic methods for the humanities. Amsterdam: John Benjamins Publishing Company. ISNAD AYDEDE YALÇIN, Meryem Nur . "Fen Bilimleri Öğretmenlerinin Aktif Öğrenme Eğilimleri". Kastamonu Eğitim Dergisi 25 / 2 (March 2017): 517-534.